We are supplying and exporting a wide range of T-Shirt Type Carry Bags. 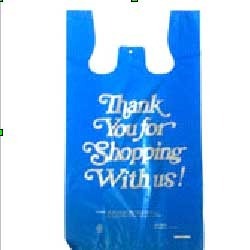 Best virgin material procured from trusted vendors is used in the manufacturing process of these carry bags. Backed by advanced infrastructure facilities and a team of professionals, we have been engaged in supplying and exporting of Polypropylene Woven Bags, the entire range of FIBC/Jumbo Bags and a wide range of Polythene Bags. Our wide range of bags includes PP Woven Sacks, PP Woven Bags, Poly Propylene Bags, Rafia Bags, Laminated PP Woven Bags, Valve Type Bags, Coloured PP Woven Bags, Printed PP woven Bags, Polythene Bags, T shirts Bags, Garbage Bags, D cut Bag, HDPE Bags, FIBC Bag, Jumbo Bag, Baffle Bag, Leno Bags, Big bags, U Panel Bag, Circular Big Bag, Jumbo Bags With Loops, FIBC Bags With Loops and Packaging Bags. Our supplies are known to be “Best in class” in terms of, strength, dimensional accuracy, Sharp printing quality and colour consistency. We offer 100% customized bags, as per the requirements and specifications of customers.